High performance teams are a league of their own because no two teams are the same. How a team interacts can set a level of communication, collaboration and adaptation that can result in outstanding levels of effectiveness and efficiency. The ultimate goal is for the team to be happy and remain passionate about their purpose. Often, I look outside my domain to gather new insights. Outside Agile software development, my two favorite high performing groups are Formula 1 pit crews and jazz bands. I admire fast F1 pitstops that last 2 seconds. How is that possible? F1 pit crews comprise nearly 20 people that travel around the world to different tracks. Each team member is trained for a specific task. There are three people per wheel, two jack operators and other mechanics fulfilling other functions. During a season crews train incessantly at the factory and during race weekends with hundreds of pitstop practices. If anything goes wrong during a pitstop, improvisation and trust on your teammates is key to recover. Last time I watched a jazz band, members continuously change roles. Everyone leads and follows. How is that possible? Jazz bands have very talented musicians that often play multiple instruments. Often band members have the freedom to improvise and be creative while harmony is maintained. It is common for jazz bands to practice long hours to achieve a high level of cohesion in their music. In Agile software development, communication, collaboration and adaptation to change are also very important. If teams stay together long enough, they will transition between three growth stages – storm, form, norm – before transitioning to high performance. Many publications exist around Agile high performing teams but very seldom it is difficult to quantify thresholds. For example, it is challenging to estimate how much additional communication or collaboration is required for a team to reach high performance. Why do these five traits matter? Fixed cost, variable scope projects, typically result in team autonomy. The team has to deliver business value quickly and often, in order to gain stakeholder trust. Autonomy is sometimes wrongly associated with team disengagement from the business. This should never happen if the team has a clear purpose and business KPIs to fulfill. It is very important to first understand the reason before tackling the what and how. With that order in mind, team motivation and drive is always high to take risks and improvise. Knowledge consolidation by a single team member. If a team member leaves or gets sick, team productivity should not slow down. Communication with external stakeholders. If frequency or format is not optimal, visibility is weak and autonomy may be challenged in favor of more control. One key risk tackled by high performing teams is juggling between fast and slow decision making. Too much fast decision making results in decisions not recorded and quickly forgotten. A lot of slow decision making leads to documentation and analysis overhead that can interfere with team momentum to quickly deliver value. When teams improvise, they move fast, switch roles, and sometimes process is replaced by common sense. Often improvisation is triggered to remove a blocker. Trust and listening is very important to hand over the lead to someone else. Last and most important, is how teams listen to each other. We seldom fall into the trap of thinking what we want to say next instead of following up with the received message. I have yet to nurture listening with a team by participating in improvisational theatre. It would be so much fun! 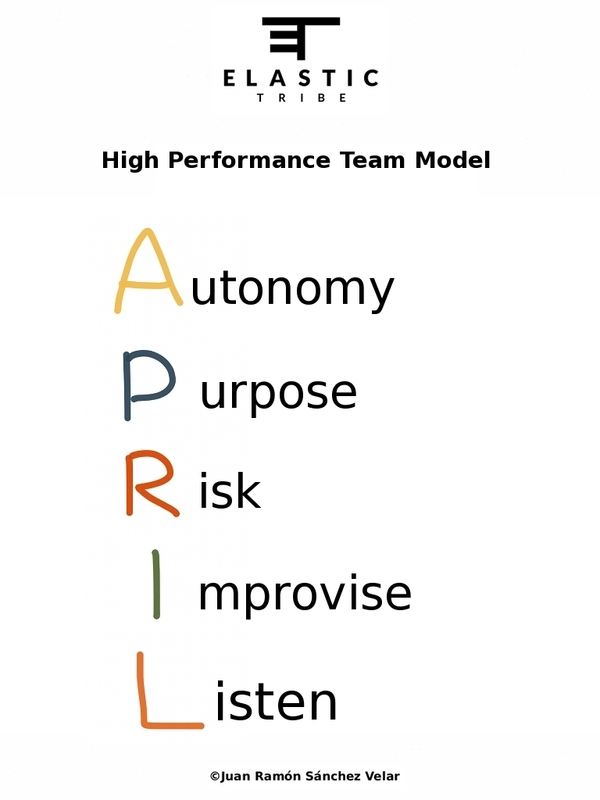 What is your high performance team model? Hi there, I diceevsrod your website by means of Google whilst searching for a comparable topic, your site got here up, it appears to be like good. I’ve bookmarked it in my google bookmarks. to find someone else with just a few original ideas on this topic.